Amir Jul 24 2017 10:02 am where is Gomi's information??? I mean;first son of dae jo yeong. Joseph BD May 27 2017 1:49 am I watched these series for more than 4 times now and presently watching again. it makes me feel as if i have been to Korea. I had Watch Jumong but when I watch this I transfered my love to Deo Jo Young. I Like you guys. Lydia Lyn May 25 2016 5:12 am This serie is must much watch from the Historical collection... its a great performance showing how rich their history is. I question Shin-Hong’s loyalty for his claimed master Li-Kaigu; I see it was a way he could fulfill his selfish desire to avenge for killing his former master. In my Language ''Luganda'' we say "kissuffu"
Hamed Jul 30 2015 3:33 am Its very very very gooood . Richard Feb 09 2015 10:05 am I really like this serie a lot, I have only seen until chapter fifty and I would like to know if the serie is still running or it has finished already. I have seen in some wed pages that has about 100 another said that it has 134 chapters, I would reallty like to see them all, please who can let me know about? I´d appriciated a lot. Amadu Adamu May 25 2014 3:22 pm I have developed deeper love for Koreans based on the movie entitled dae juyoung. I wish I will get an opportunity to visit south Korea and interact with the passionate individual actors of the movie. Infact I have been moved by the qualities used in movie such as loyalty, trust, respect, commitments to services, leaders love for subordinates, and others. If I can only ask some questions based on areas I'm not clear, I would be happy. can you please provide such opportunity? Aderotimi Joseph Feb 20 2014 1:43 pm I love this movie epecially Daejo young, Suk young mama, Cho-rin and Li Kiagu. They are great actors. I wish to travel down to Korea someday. I also love the sound track, they're touching and emotional. Since am a keyboardist, I rehearsed it. Wish to study music in Korea. Toni Nov 04 2013 2:47 pm u forgot the second best actor!!!!!!!!!! Lee Hae Go! who died in part 133!! franklin Oct 08 2013 6:46 am please i have one plea...do not stop this very movie,it should not have an end because i cannot imagine how i can possible stop watching.please add some more to this movie and do anything you can,your fans are waiting.unbelievably i never knew about this movie before a friend introduced me to it,and one funny thing is that since ever i watched it i have no interest in any other movie at all.no movie on this planet is so exciting than this movie. in my life the second best to all the movies i have watched is the lords of the ring,this movie comes first.korea has become my favorite movie industry.i love and thank all that made this movie worth while,you are the best in the world. johna Jul 09 2013 5:24 pm The best series I have watched. Look forward to each week. Choi Soo-Jung and the actors are superb. Thank you for a wonderful epic. Acee Gee Apr 13 2013 6:46 pm This is the best series I've ever watched, at first, I wasn't interested, but then then, it becomes really interesting in me ,so I like the history of Korean better than my own history because of this series. soo Feb 18 2013 11:10 am One of my very best warfare movie i have watch for the pass 40 years. Excellent movie ! 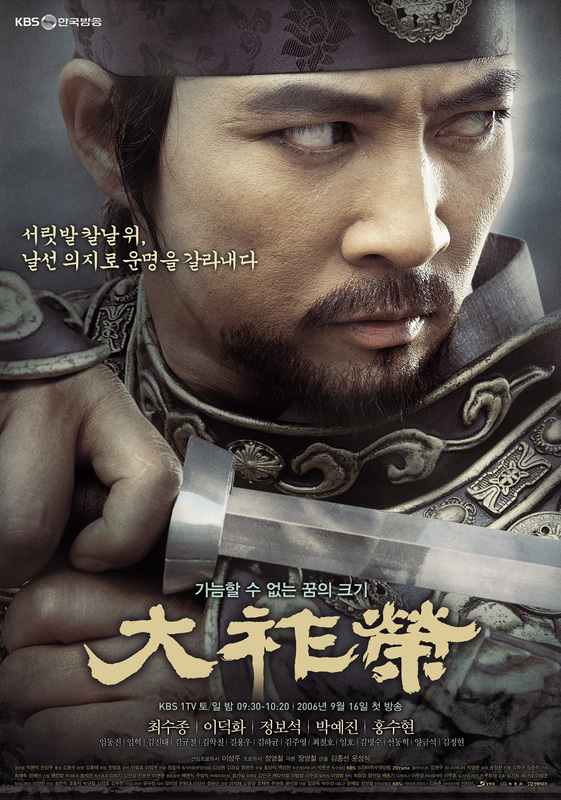 Actor Choi Su-Jong is perfect in this movie. Other actor and actress contribute there part to make this movie worth watching. Thanks to the director on making this movie so perfect and a success. Daduxing Dec 28 2012 3:00 am This series is racist, especially against the chinese. I saw that the racism is a common thing at Yun Seong-Sik tv series. Catlover May 11 2012 6:11 pm i love this so much!!! Best Korean drama EVER! irundjan1 Sep 30 2011 4:31 am it's really interesting, it differs from stupid serials, assessess the history of Korea in a sensible and nice way, with ideal acting. I really want to cry after every episode. Thank you very much Choi Su-Jong, YOU ARE REALLY EXCELLENT ACTOR. Please shoot more! Johnosa Sep 19 2011 2:10 pm It is a134ep.